AMD is gearing up for launch of its Bulldozer FX Processors this month and details on its 2nd Generation Piledriver core have already started to emerge. 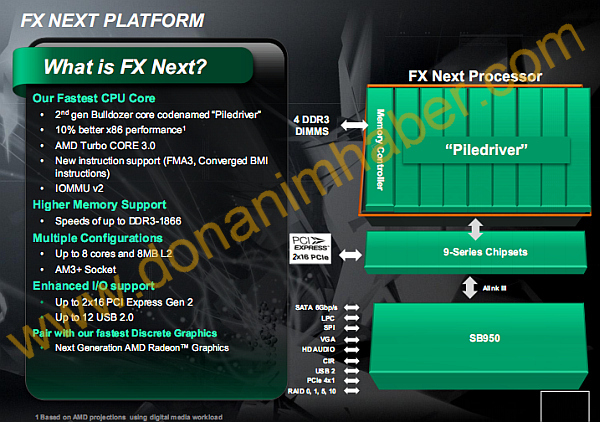 This latest report from Donanimhaber details AMD’s Next Generation Bulldozer Enhanced Core codenamed “Piledriver” which would feature enhanced x86 Performance, Turbo Core 3.0, etc and would launch in Q2/Q3 2012. The Architecture chart details that we can expect a 10-15% better x86 Performance Per Core when compared to current Bulldozer (Zambezi-FX) Processors yet to be released. So a gain of 10% in core performance means that Piledriver would easily outperform current Sandy Bridge (1155) and Entry/Mid Level Sandy Bridge-E (Socket 2011) CPU’s but Intel is also preparing its Ivy Bridge Processors which would launch at the same time in Q2 2012 (April – March). Piledriver would also feature Turbo Boost 3.0, Details of which are yet unknown. But we do know that current Turbo Core 2.0 will pump up the clock frequency upto 1Ghz provided half of the cores are functional, The Turbo Core would be halved if all cores on the CPU are operational. Bulldozer 2nd Gen Piledriver will provide a new Instruction Support set (FMA3, Converged BMI instruction). A Built-in Memory Controller on Piledriver chips would be directly connected to 4 DDR3 DIMMS with stock frequency support of 1866Mhz in Dual Channel Mode. The whole platform would be supported by the AMD 9 Series Chipset based motherboard (AMD 990FX/SB950, AM3+ Socket). This would allow for 2 Full x16 Bandwidth PCI-e 3.0 slots and upto 12 USB 2.0 port support. South Bridge 950 chipset would be interconnected with SATA 3 Ports, VGA, HD Audio Jack, PCI-e 4x 1, Raid 0,1,5,10.